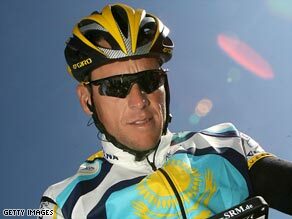 Lance Armstrong has been cleared to ride in this year’s Tour de France after the French anti-doping agency (AFLD) confirmed they would not be launching any disciplinary procedures against the seven-time champion. The AFLD opted not to take any action against the 37-year-old, following an incident in the French riviera town of Beaulieu-sur-Mer on March 17. The American returned from a training ride to find a doping official at his French home. The Astana rider asked for the official’s credentials to be confirmed by world governing body UCI and, while this was going on, he was given permission by the official to take a shower. “We asked the official to wait outside while we checked to see if he was legitimate,” said Armstrong at the time. After looking into the incident, the AFLD confirmed in a statement that no rules had been broken by Armstrong and, as his urine and blood samples both proved clean, there was no case to answer. Armstrong said on his Twitter site he was delighted with the news. “Just got the word from the French agency AFLD on the showergate incident. Case closed, no penalty, all samples clean. Onward,” said the American, who is now free to compete in all French races — and is expected to attempt to win his eighth Tour title in July. The seven-time champion, who has undergone 24 drug tests since returning to the sport in September last year, had become increasingly annoyed with the AFLD. “I know that my comeback wasn’t welcomed by a lot of people in France,” Armstrong said in a video message as he awaited the AFLD’s judgment. Armstrong is currently recovering from surgery after breaking his collar bone in a race in Spain last month. However, he is about to start an intensive training program in Aspen, Colorado, in the hope of making it to the start line for the Giro d’Italia, which begins on May 9.